8 steps you can take today to start your recovery journey- whether you're healing from an eating disorder, body dissatisfaction or "food weirdness"
Healing your relationship with food & body is not a linear process by any means. 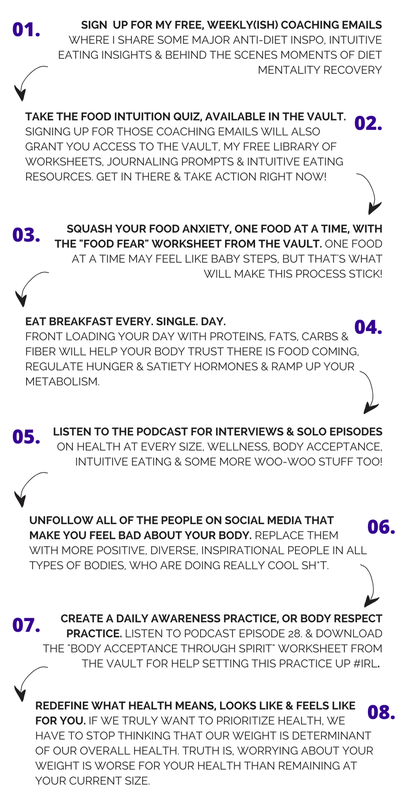 But there are some simple steps you can take to break free from the constant thoughts of food, guilt, and body shame. These steps may feel small, but they are the foundation from which recovery happens! Ready for more? Check out my free worksheets in the vault!